What kind of person ties a rope around the neck of a barely 3 month old pup with a large stone and claims she is taking it to throw in the river because it is ‘smelling’??? 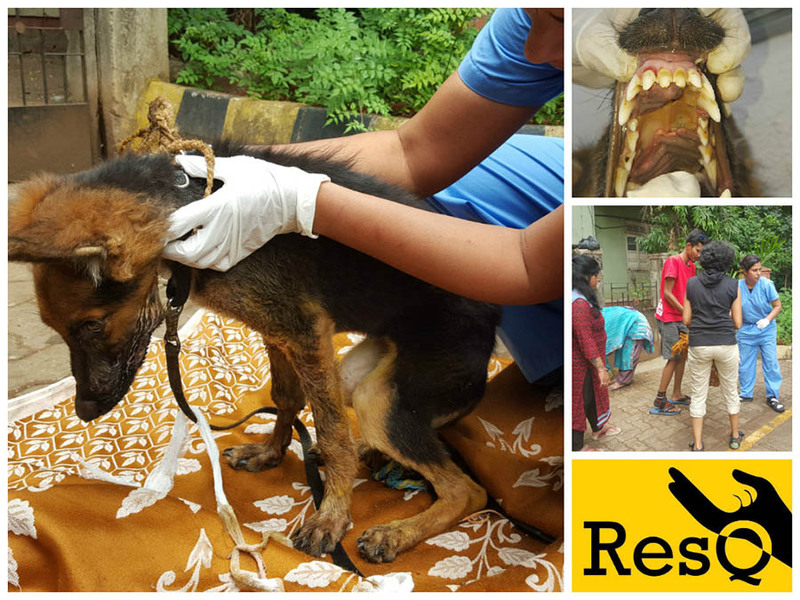 A regular RESQ caller and volunteer, Archana, found a lady (named Mrs. More in Shivajinagar area) dragging this poor pup with a swollen face and rope tied around the neck with a large stone. She stopped and asked her what is going on? Mrs. More’s blatant reply was “no one wants this smelling dog in my house, so I am going to throw it in the river”. Archana was aghast to see the large stone hanging from this poor pup’s neck. She took the dog from the lady (who happily handed her over to get rid of her) removed the stone, called and brought the dog to RESQ. Heidi’s jaw is full of wounds and maggots. Her soft palate is eaten up by maggots and nostrils are exposed open in the mouth which essentially means if she drinks anything it will go straight into her lungs and will she aspirate. She is severely dehydrated. She is a 3 month old German Shepherd and has a temperament of GOLD. Heidi is currently under treatment at RESQ and a wonderful human cosmetic dental surgeon has agreed to attempt reconstructing her upper soft palate. It is a long shot we are taking, there is very little hope that she will survive this, but we don’t want to give up without trying everything possible there is to try. We are sending Archana and some RESQ volunteers back to confront this Mrs. More and hopefully record a confession. We are not sure what to do next about this horrible lady because right now, all our efforts are focussed on Heidi surviving.